The London Aquatics Centre in Queen Elizabeth Olympic Park is celebrating its 3rd anniversary of being open to the public with an Open Day full of swimming and fitness activities on Saturday, 4th March. More than 2.5 million people have visited the former Olympic venue since it opened its doors to the public in 2014. It has quickly established itself as a world-class sporting venue at the heart of its community. Visitor numbers continue to rise each year, and have grown by 47% since March 2016. Over 14,000 people visit the Aquatics Centre on average each week, with school, club, regional and national meets throughout the year. The London Aquatics Centre demonstrates how the Olympic and Paralympic legacy is being fulfilled every day. 4,500 children and adults are learning the essential life-skill of swimming each week with the centre’s ‘Swim School’ programme, as well as learning to dive with the Tom Daley Diving Academy. 50 different local schools and clubs use the Aquatics Centre for their swimming lessons, enabling thousands more school children to learn to swim. The centre encourages participation by everyone in its community with many different programmes such as family ‘Extreme Aqua Splash’ and ‘This Girl Can Swim’ sessions. Voted by visitors to the London Olympic and Paralympic Games as the best venue of London 2012, the past three years have seen the London Aquatics Centre make its mark on the national and international stage, hosting a number of major sporting events including the FINA Diving World Series, National Paralympic Day, Invictus Games, the British Swimming Championships and the 2016 LEN European Aquatics Championships. The London Aquatics Centre is also used as an elite training venue and is the training home of Olympic medallist Tom Daley. Peter Bundey, Deputy Managing Director at GLL, the charitable social enterprise that operate the London Aquatics Centre under the Better brand, said: “The London Aquatics Centre is an inspiring and important legacy venue. Its remarkable attendance figures from both local communities and across the country demonstate the centre is helping more and more people stay active and healthy. This fantastic venue is also fulfilling its vital role as a national and international home for swimming and diving, with resident high performance aquatic programmes and major aquatic events. To celebrate the anniversary, the London Aquatics Centre is holding an Open Day on Saturday, 4th March offering children and adults ‘Come Try Diving’ sessions, ‘Racing Starts Drop-ins’ and a swimming ‘Stroke Clinic Drop-in’, as well as activities away from the pool with Pilates and Dance Taster sessions available and fitness challenges with prizes for the winners. London Aquatics Centre gym members can also bring a buddy to train with for free on the day. The ‘legacy-mode’ refurbishment of the London Aquatics Centre following the games of 2012 is now complete and this extraordinary structure by Zaha Hadid Architects has opened to great acclaim for the public to enjoy. 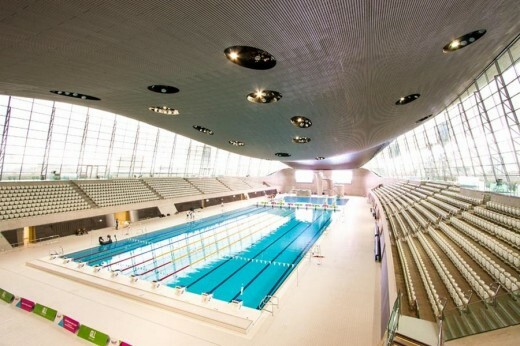 The new facility was described by the Guardian newspaper as “the most jaw-dropping municipal swimming pool in the world…a great legacy.” The Aquatics Centre has been adapted to its new use by replacing the temporary spectator stands with glazing, and creating new facilities to the interior of the wave-like structure, such as a reception desk and wall cladding made from DuPont™ Corian® high tech surface. In the lift lobby of the main entrance, the sophisticated beauty of DuPont™ Corian® has been applied to create wall cladding in the new Deep Nocturne colour, a classic jet black made with innovative DeepColour™ Technology (patent pending). Developed by DuPont to offer deeper, more intense dark colours for Corian® with improved wear performance and easier fabrication, this ground-breaking manufacturing process significantly enhances the palette of dark colours available to architects when specifying a high performance solid surface. 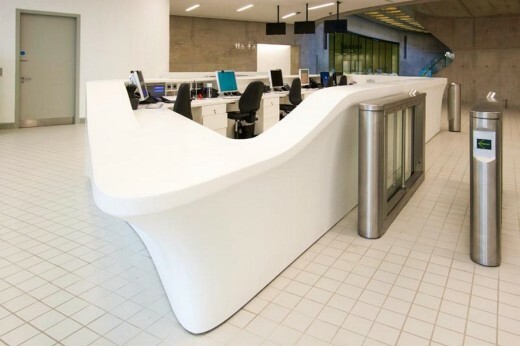 DuPont™ Corian® also adds to the enticing welcome for the public in the form of a dramatic reception desk. 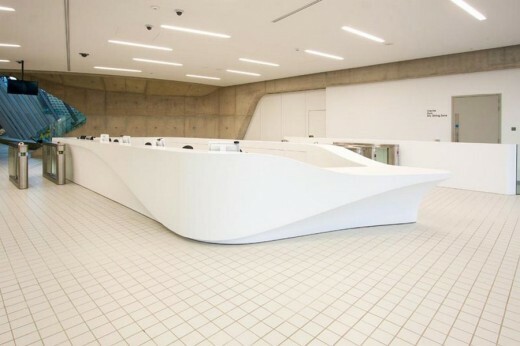 Featuring the kind of sensual curves that are a signature of Zaha Hadid Architects, the installation maximises the versatility of DuPont™ Corian® to create an elegant, welcoming and ultra-functional design. As with the wall-cladding, the desk has been fabricated and fitted by renowned experts Cutting Edge. It is made from DuPont™ Corian® in the Glacier White colour choice and offers a durable, pristine and easy-care finish that will perform reliably in a high-traffic environment. This design theme continues in the form of low walls to the entrance barriers and sinuous display and interactive information units, also made from DuPont™ Corian® in Glacier White. 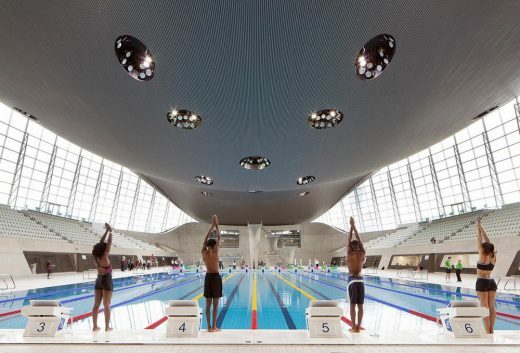 welcome the public to the refurbished ‘legacy mode’ Aquatics Centre by Zaha Hadid Architects. Photo courtesy of Cutting Edge, all rights reserved. The double curvature of the desk was achieved through skilled thermoforming and seamless joining techniques and the design also features integrated doors, drawer boxes and cable covers made from DuPont™ Corian® for a coherent finish. 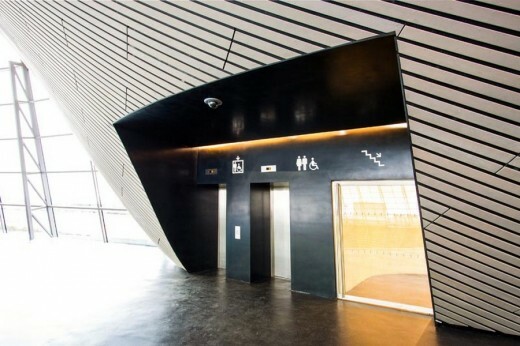 “With this project, Corian® allowed the architects the freedom to explore any shape they desired. Similarly, with the freestanding pieces, the material ticked all the necessary boxes in terms of both looks and function,” adds Kevin Hoy. The Aquatics Centre was designed, both for its competitive and its community use, by Zaha Hadid Architects and was constructed by Balfour Beatty. It is part of the £300 million legacy transformation of the Queen Elizabeth Olympic Park for the London Legacy Development Corporation. Housing two 50-metre swimming pools, a diving pool and training facilities, the Aquatics Centre is now operated by Greenwich Leisure Ltd.
• There are almost 600,000 tiles in the whole building. • The Aquatics Centre is open to swimmers of all abilities, Monday to Sunday from 6:30 am to 10pm opening days, hours and entrance costs from £2.50 to £4.50 per session. About DuPont™ Corian® (www.corian.co.uk) – First created as a high performance material for kitchen and bathroom worktops, DuPont™ Corian® is now – thanks to its unique combination of functionality, versatility and beauty – a leading global brand among surfacing materials for interior design and architecture. Over the years, DuPont have turned DuPont™ Corian® solid surface into an exceptional design tool for every application one can imagine. Kitchen, bathroom, lighting, furnishing, facades, seating, radiators, home automation, touch control surfaces: today, DuPont™ Corian® can be found almost everywhere in Commercial, Residential and Public Space applications. DuPont – DuPont has been bringing world-class science and engineering to the global marketplace in the form of innovative products, materials, and services since 1802. The company believes that by collaborating with customers, governments, NGOs, and thought leaders we can help find solutions to such global challenges as providing enough healthy food for people everywhere, decreasing dependence on fossil fuels, and protecting life and the environment. For additional information about DuPont and its commitment to inclusive innovation, please visit www.dupont.com. The DuPont oval logo, DuPont™, Corian®, DeepColour™, Endless Evolution and the Endless Evolution logo are registered trademarks or trademarks or copyrighted material of E. I. du Pont de Nemours and Company or its affiliates. Other logos, trademarks and registered trademarks are a property of their respective owners.